Whether austere or humble, public or intimate, locations of historical significance in the Texas Hill Country offer much to the average visitor. On trips to two renowned places, we rendezvoused with the past. Battles have been fought, heroes born, and pivotal laws passed in the Hill Country. The state’s capital hums in the northeast corner of the region, and legendary names echo throughout. Unsurprisingly, the region acts as a magnet for history buffs. We paced hallowed halls and one very famous birthplace to immerse ourselves in all the heritage. Flanking the northern edge of downtown Austin, the Texas Capitol conveys the grandeur of the nation’s second-largest state through sheer gravitas. Indeed, its scale is the first thing that impressed us. Rising 308 feet, the four-story building has 400 rooms, 900 windows, and 306,000 square feet of floor space. It looms over a park-like landscape dotted with stately monuments, each a stony satellite of the legislative stronghold. But it’s beautiful, too. Completed in 1888 and extended in 1993, the building bears the ornate touches of Italian Renaissance Revival architecture. From the 22-acre grounds, we enjoyed an up-close view of the facade, with its transfixing interplay of straight and curved lines, and the iconic dome capped by a zinc statue of the Goddess of Liberty. Wandering the surrounding site, we stopped by the outdoor monuments, which include 19 nods to the state’s complex history. Tributes to the heroes of the Alamo and to Confederate soldiers are followed by homages to children and law enforcement officers. My favorite was a new addition, a 2012 sculpture by Armando Hinojosa, with five plaques bearing the story of Tejanos in Texas. History also thrums inside the building. Life-size marble statues of two of Texas’ forefathers, Stephen F. Austin and Sam Houston, stand in the southern foyer. We spent several minutes examining the terrazzo floor, which recognizes 12 battles fought on the state’s soil. In the rotunda, we paused before portraits of state governors and presidents of the former Republic of Texas. And of course, there’s the rotunda’s gorgeous interior view of the domed ceiling. A heavenly sight with an iconic lone star at its pinnacle, the ceiling is likely the most-photographed part of the building. We did not reverse or slow that trend. The Capitol is open daily for both guided and self-guided tours, and a stop at the visitors center, with its videos and interactive exhibits, is highly recommended. Lyndon Baines Johnson, who served as the 36th U.S. president from 1963 to 1969, was JFK’s successor, a supporter of civil rights, and a driving influence in social reform. Biographer Robert A. Caro called him a “codifier of compassion,” and Johnson’s legacy of goodwill lives on in street names, history books, and policies that survive to this day. He was also a native Texan. 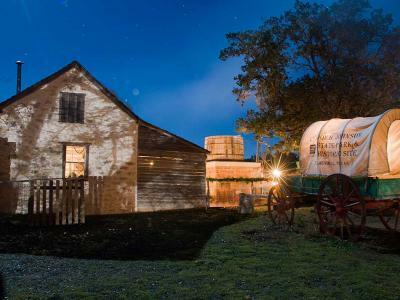 Visitors to the Hill Country can find out all about his origins at the Lyndon B. Johnson National Historical Park, which encompasses his boyhood home in Johnson City, and 14 miles to the west of that, near Stonewall, the LBJ Ranch, where Johnson and his wife spent most of their years. Our two-hour trek included both sites, with planning help from visitors centers run by both national and state park systems. There are so many LBJ-related sights to see, it’s necessary to get appropriate driving permits and devise a game plan. We had an entire afternoon to explore both the boyhood home and the ranch. The former is a step back in time. Historians and architects meticulously reconstructed the home as it would have been in the 1920s, when Johnson was a teenager. The best part was the guide’s storytelling, as she recounted the lessons that Johnson learned from his father, a state legislator. A short tour of the grandparents’ nearby home was just as pleasant. Those humble trappings contrast with the LBJ Ranch, where we took in 1,500 acres of scenic Hill Country and an estate home nicknamed the “Texas White House.” Johnson was born and died here, and First Lady Lady Bird Johnson, spent her golden years modernizing the place. Our 30-minute tour included the president’s office, living room, dining room, and bedroom suites. We especially loved the president’s classic cars: a German-made Amphicar, a 1934 Ford Phaeton, and a Lincoln Continental Convertible. Those personal touches filled the property, granting intimate glimpses of a man who made history. LBJ took “unsuspecting victims” for joyrides in his Amphicar, careening off the road into the Pedernales River outside his home to see how they’d react to impending doom. The joke, of course, was that the car was also a boat.